When it comes to enhancing forms, CSS has its limitations. That’s where HTML5 comes in. Following the same migratory pattern from scripted to declarative solutions, the specification introduces many new form enhancements. These features were originally part of a WHATWG specification called Web Forms 2.0, based upon existing work at the W3C. That specification has now been rolled into HTML5. fig 4.01: “Owl stretching” appears in the input field via the placeholder attribute. The placeholder attribute works wonderfully in the browsers that support it, but, alas, that’s a fairly small subset of browsers right now. It’s up to you to decide how you want to deal with other, non-supporting browsers. This works by creating a “phantom” element in memory— but not in your document—and then checking to see if the prototype for that element has a property with the same name as the attribute you are testing for. The function will return either true or false. When the document loads, automatically focus one particular form field. The only problem with this pattern is that it can be annoying as hell. When I’m surfing the web, I often hit the space bar to scroll down to content “below the fold.” On sites like Twitter that use the auto-focus pattern, I find myself filling up a form field with spaces instead. I can see why the autofocus attribute has been added to HTML5—it’s paving a cowpath—but I worry about the usability of this pattern, be it scripted or native. This feature could be helpful, but it could just as easily be infuriating. Please think long and hard before implementing this pattern. The autofocus attribute doesn’t only work on the input element; it can be used on any kind of form field, such as textarea or select, but it can only be used once per document. Browsers don’t simply display web pages. Most browsers have additional features designed to enhance usability, security, or convenience when surfing the web’s tide. 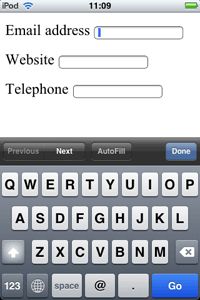 Automatically filling in forms is one such feature. Most of the time, it’s very useful, but occasionally it can be annoying or even downright dangerous. I don’t mind if my browser remembers my contact details, but I probably don’t want it to remember the log-in for my bank account, just in case my computer is stolen. 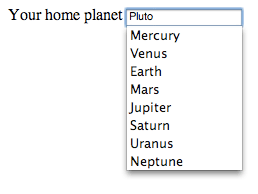 By default, browsers will assume an autocomplete value of “on,” allowing them to pre-fill the form. The ability to disable auto-completion in browsers might seem like a strange addition to the HTML5 specification. HTML5 is supposed to be codifying prevalent patterns and this isn’t a very common use case. But given the potential security risks that auto-completion enables, it makes sense to allow website owners to override this particular browser feature. This allows users to select an option from the list provided or to type in a value that isn’t in the list at all. This is very handy for situations that would normally require an extra form field labeled, “If ‘other’, please specify …” (fig 4.03). fig 4.02: The new datalist element. fig 4.03: The datalist element, showing that the user can type in a value that is not in the list. The datalist element is a nice, unobtrusive enhancement to a form field. If a browser doesn’t support datalist, then the form field behaves as a normal input. The type attribute of the input element is being greatly expanded in HTML5. There are so many cowpaths to pave, it’s like doing construction work in the aftermath of a stampede. The only difference between “text” and “search” is that a browser might display a search input differently to be more consistent with the styling of search fields in the operating system. That’s exactly what Safari does (fig 4.04). Once again, these fields will behave in the same way as text inputs, but browsers now have a bit more information about the kind of data expected in the field. Safari claims to support these new input types but a quick look at a form in the desktop browser reveals no differences to simply using type="text". However, if you start interacting with the same form in Mobile Safari, the differences become apparent. The browser displays a different on-screen keyboard depending on the value of the type attribute (fig 4.05). fig 4.05: Mobile Safari shows a different on-screen keyboard depending on the value of the type attribute. Subtly played, Webkit, subtly played. Both Safari and Opera currently support this input type, offering similar-looking controls (fig 4.06). fig 4.06: The range input type in both Safari and Opera. Testing for native support of input types requires a similar trick to the test for attribute support. Once again, you will need to create a “phantom” input element in memory. Then, set the type attribute to the value you want to test. When you query the value of the type property, if you get back a value of “text,” then you’ll know that the browser doesn’t support the value that you set. A native input control will certainly load faster than a scripted solution that needs to wait until the DOM has finished loading. A native control will also usually be more accessible than a scripted control, although—bizarrely—Safari’s range control currently isn’t keyboard-accessible! As well as allowing the user to input a value directly into a text field, browsers can also display “spinner” controls to allow users to increase or decrease the value (fig 4.07). fig 4.07: Spinner controls where type="number" is used. 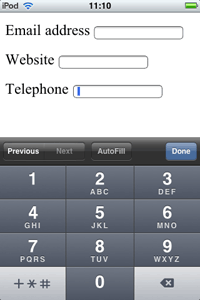 The number input type is a hybrid of text and range. It allows users to enter values directly, like a text field, but it also allows browsers to ensure that only numerical values are entered, like a range control. These calendar widgets all do the same thing, but you’ll find that they’re implemented slightly differently on each site. A native calendar widget would smooth away the inconsistencies and reduce cognitive load during the date-picking process. date is for a year, month, and day. datetime is for a year, month, and day in combination with hours, minutes, and seconds and time zone information. datetime-local is the same but without the time zone information. time is for hours, minutes, and seconds. month is for a year and a month but without a day. There is no year input type, although there is a week input type that takes a number between 1 and 53 in combination with a year. Opera implements these input types using its patented ugly-stick technology (fig 4.08). 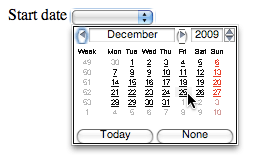 fig 4.08: Opera’s native calendar display, with the ugly-stick. // Generate a calendar widget here. Perhaps the most ambitious widget replacement in HTML5 is the color input type. This accepts values in the familiar Hexadecimal format: #000000 for black, #FFFFFF for white. The plan is for browsers to implement native color pickers like the ones in just about every other application on your computer. So far, no browsers have done this but when they do, it will be, like, totally awesome. All of these new input types serve two purposes: they allow browsers to display native controls suited to the expected input data, and to validate the value entered. These additions to HTML5 cover the majority of scenarios, but you still might find that you need to validate a value that doesn’t fall under any of the new categories. Most of the time, you’ll never need to use the pattern attribute. On the occasions that you do, you have my sympathy. It’s a good question. For the time being, the answer is “no.” Take it up with the CSS Working Group. Remember, the web isn’t about control. If a visitor to your site is familiar with using a browser’s native form doodad, you won’t be doing them any favors if you override the browser functionality with your own widget, even if you think your widget looks better. 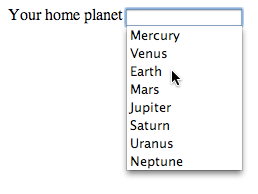 Personally, I’d like to see browser vendors competing on the prettiness and usability of their HTML5 form controls. That’s a browser war I could support. Let’s put forms to one side now, and take a look at the juicy new semantics in HTML5.